In a sprawling interview with The Washington Post's James Hohmann, Environmental Protection Agency Administrator Scott Pruitt talked about redefining environmentalism, his controversial relationships with lobbyists, and his plans to clean up abandoned mines and tackle lead in drinking water. In February Pruitt delayed a proposal to require mining companies to show they have the financial means to clean up pollution so taxpayers don't have to foot the bill, saying he wanted more input from mining companies and other stakeholders. He's made steps since then, vowing in August to make a priority of cleaning up the 2015 Gold King Mine spill in Colorado. EPA's Office of Inspector General ruled in June 2017 that the Gold King Mine spill was so bad because EPA had no rules for dealing with toxic mines that were prone to blowouts. Tens of thousands of abandoned mines still leak toxic material into streams and rivers in Western states. And just days ago, the OIG said it would review the agency's handling of abandoned uranium mine cleanup that may be causing serious health problems for Navajo Nation residents. Coal-mine cleanups are the province of the Department of the Interior and its Office of Surface Mining Reclamation and Enforcement, which manages the Abandoned Mine Lands Fund, financed by a tax on coal. Pruitt told Hohmann his close ties to mining companies and other industry lobbyists are a strength, not a conflict of interest. His agency doesn't view lobbyists as adversaries, he said, but as "partners and allies in improving the environment." 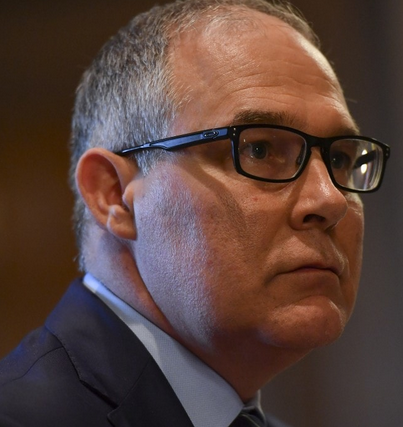 Pruitt has been criticized for listening to corporate interests than longtime staff and scientists, going so far as to hand-pick sympathetic experts to review proposed policy and blocking scientists who receive EPA grants from serving as agency advisers. He's diverged from previous EPA chiefs by refusing to promote renewable energy over fossil fuels because he believes the government shouldn't pick "winners and losers" in the private sector. However, it should be noted that the Trump administration has shown a marked soft spot for coal-friendly legislation. True environmentalism, Pruitt told Hohmann, is "environmental stewardship — not prohibition. . . The last administration talked about putting up fences. [They said,] 'Let's not develop, we're not going to use the natural resources to feed the world and power the world.' I think that's wrong. I think our focus should be on using our natural resources — with environmental stewardship in mind. … We can be about jobs and growth and be good stewards of our environment. The last several years we've been told we can't do both."